A must-have for every new mom is a good swaddling blanket! SwaddleDesigns offers the perfect multi-use blanket for every new baby! SwaddleDesigns® recently introduced the new SwaddleDuo™. SwaddleDesigns Cotton Marquisette is similar to muslin but is made from premium quality yarns. 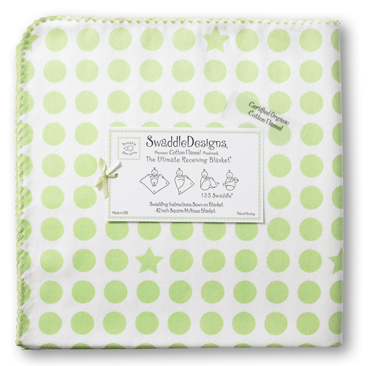 SwaddleDesigns Cotton Flannel is made from premium preshrunk domestic cotton. 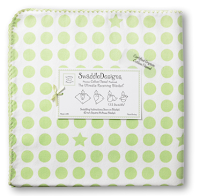 I generously received the SwaddleDesigns - Organic Ultimate Receiving Blanket in Pastel Kiwi Dots & Stars with Pastel Kiwi Trim! I absolutely love that they offer organic blankets because it is so important to me to only put organic materials on and near my baby! This blanket was so soft and I love the generous size! The colors and shapes are gender neutral and will fit perfectly in our new daughter's nursery! My favorite part about SwaddleDesigns Blankets is that they all include swaddle directions on the tag in case you have a "mommy moment" and forget during your lack of sleep phase! :) Plus, SwaddleDesigns has a great “How to Swaddle” guide and pictures on their site and more information regarding sleeping environments and the benefits of swaddling. 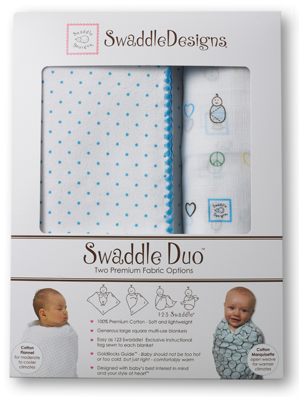 Buy It: You can purchase the SwaddleDuo (available in 17 styles) for a MSRP of $38 on the SwaddleDesigns website. Win It: SwaddleDesigns is generously offering (1) choice of Pink or Blue SwaddleDuo in the Classic Peace Love Swaddle style to a lucky winner!